For many years, mints around the world have been grappling with a rather thorny problem. With the average age of coin buying customers increasing every year, it is becoming more important than ever to find new and interesting ways to tune younger audiences into the fascinating world of coins. In recent years, we have seen mints offer a wide range of coins designed specifically to appeal to younger customers. Some of these are quite technically clever, like glow-in-the-dark dinosaur coins that reveal their skeletons when the lights go out. The Royal Canadian Mint is currently offering a range of colourful glow-in-the-dark coins that they claim provide a “mesmerizing effect” when exposed to light. Scented coins are also making an appearance. In 2010, Benin produced a coin set called “Famous Plants of the World’ in which each coin, when rubbed, revealed the distinct aroma of a particular plant. To ensure that the series received the maximum possible international publicity, the first coin to be released just happened to depict the Cannabis Sativa, thereby providing numismatists everywhere with the perfect excuse to explain the unmistakable smell of marijuana emanating from their bedrooms. Sadly, my appeals to The London Mint Office to purchase scented coins from Benin for research purposes have proved unsuccessful at the time of writing. Instead, they have shown me the officially licensed ‘Guardians of the Galaxy Vol. 2’ coin set, which features some innovative new technology of its own to appeal to the youth market. The film has been a huge hit in the box office and is expected to gross a worldwide total of over a billion dollars when it is released on home media formats next month. Unusually for a sequel, it has already surpassed the lifetime gross of the first film. Suffice to say, if you are fortunate enough to belong in their target demographic you are more than likely to have seen the film and will be anxiously waiting for a copy in your stocking this Christmas. It is not unusual for wildly successful family movies to be accompanied by a huge range of officially licensed merchandise. I can still remember the avalanche of cup holders, lunch boxes, action figures, key rings, T-Shirts and bad electronic games that appeared when the movie E.T. came out, mainly because most of them were waiting for me under the Christmas tree that year. However, coin sets do not traditionally make it onto the ‘must have’ list of film tie-in memorabilia. Until now, that is. The first thing you notice about the officially licensed ‘Guardians of the Galaxy Vol. 2’ coin set is that this is a high-end product designed to last much longer than your typical film related souvenir. Of course, the price is also a subtle reminder of this fact. Officially licensed merchandise is always more expensive than unofficially licensed merchandise. In this instance, customers have the reassurance that comes from knowing that the Marvel Comic Universe has evaluated the set and considers it worthy of their brand. When you remove the packaging, you will see why. The set is housed in a colourful lunch-box sized tin box, which opens to reveal five separate capsules. 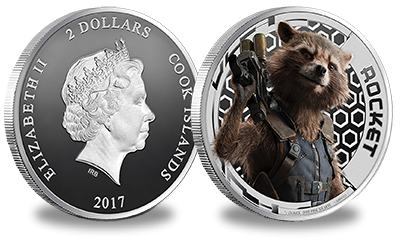 Each capsule contains a beautifully finished selectively coloured coin featuring one of the Guardians. 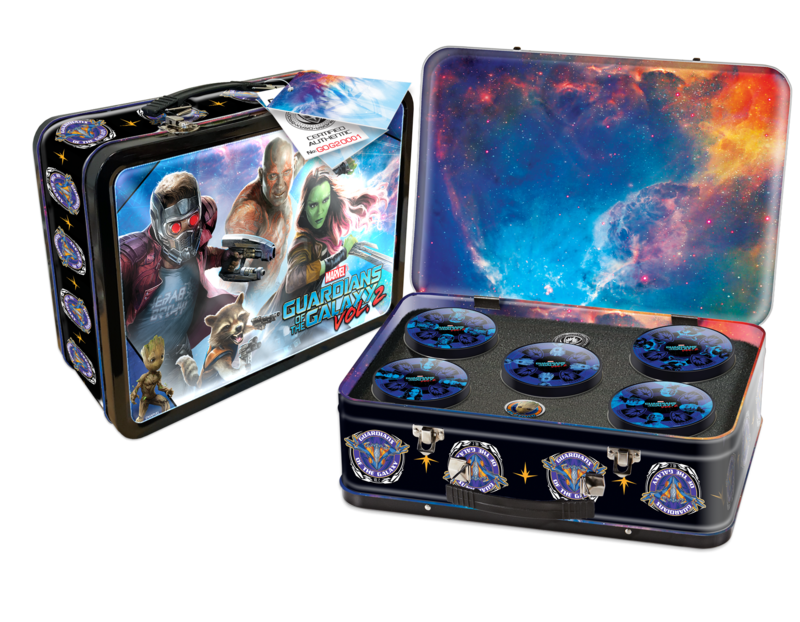 Fans will be relieved to find that Rocket, Drax, Star Lord, Gamora and Baby Groot are all present and correct, and depicted in high relief on the fine silver coins. The quality is stunning, as you would expect from an officially licensed product. The London Mint Office have packed some fun extras into the box at no extra cost. In addition to an official film poster, there are also two exclusive metal pin badges. However, it was the certificates of authenticity (cunningly disguised as an Awesome Tape Mix) that really caught my eye. It’s the first time that I have ever seen a certificate use augmented reality to provide additional information about the coin, and I am very excited at the opportunities that this presents. Augmented reality works by superimposing a computer-generated image onto an object when you view it through the camera of a tablet or smart phone. In this instance, it helps to bring the certificate to life, as additional data about each of the characters, photographs and coin specifications literally jump off the physical page and hover over it. The potential applications for augmented reality within the coin world are limitless, and I’m hoping that this will become a regular feature on future coins and sets, and not just ones featuring officially licensed movie merchandise. We are living in an age where almost everyone has access to a tablet or a smart phone. Imagine if your coins commemorating the Battle of Hastings, Sir Isaac Newton or Winston Churchill could unlock exclusive multimedia content that is only accessible by people who have that specific coin? Frankly, anything that can help to communicate the stories behind the coins in an interactive, imaginative and engaging way will always get my vote.